Bia Media Observation Report for the months of October-November-December 2017, prepared by RSF Turkey representative Erol Önderoğlu, has been published. According to the report, 122 journalists are in prison. 36 news sites and articles, eight caricatures, six books and three newspapers have been censored. 39 journalists are defendant over “insult”. Attacks increase and threats become more widespread. 46 journalists were left unemployed. “Prison uniform” is enforced on the journalists who are tried in “coup” and organization cases under the State of Emergency extended for the fifth time. Turkey has been a subject of the European Council rather than the European Union due to anti-democratic practices. 122 journalists and media staff are in prison in Turkey which is counted as “one of the biggest prisons in the world for journalists” by the RSF and CPJ. The journalists face 237 aggravated lifetime imprisonment and 3 thousand 672 years and 6 months in prison. 520 journalists pending trial without arrest face the threat of being sent to prison. 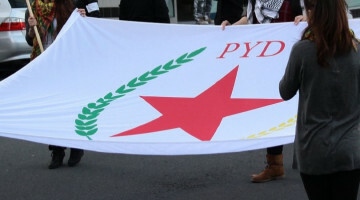 There are chapters such as “killed journalists”, “imprisoned journalists”, assault, threat and obstructions”, “impunity / seeking rights”, “investigations, opened-ongoing legal suits, verdicts”, “insult, personal rights and suit for damages”, bans, closings”, “Constitutional Court”, ECtHR” and “RTÜK”. Journalists were charged with “being a member of an armed organization”, “aiding an illegal organization”, “propagandizing for an illegal organization” or “forming an organization”, “participating in coup”, “targeting state’s unity country’s integrity” during October-November-December 2017. 122 journalists tried due to their professional activities or political cases entered January 1, 2018 in prison. 79 of the imprisoned journalists were working at pro-Gülen Community media outlets. 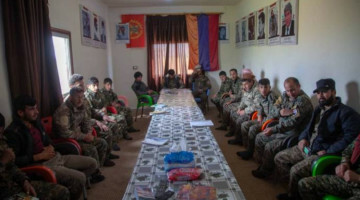 24 journalists were from Kurdish media. 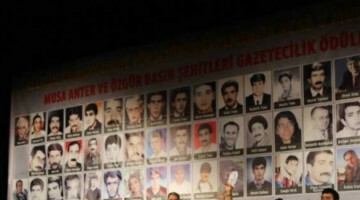 The remaining 19 journalists were with Cumhuriyet (3), Evrensel (1), Die Welt (1), Sosyalist Dayanışma dergisi (1), Atılım (1), Eylül Hapishane magazine (1), ETHA Agency (2), Emek-Adalet magazine (1), Özgür Gelecek (1), Odak (1), Mezitli FM radio (1), Yeni Evrede Mücadele Birliği Magazine (1), Nokta (1), TV10 (1), Solyayin.com (1). One other was a freelance photo-reporter. 66 of the 122 imprisoned journalists are being tried, 31 others are being prosecuted. 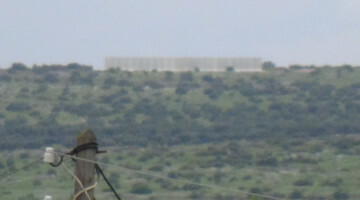 21 of the imprisoned are convicts, four wait for the result of their appeal. 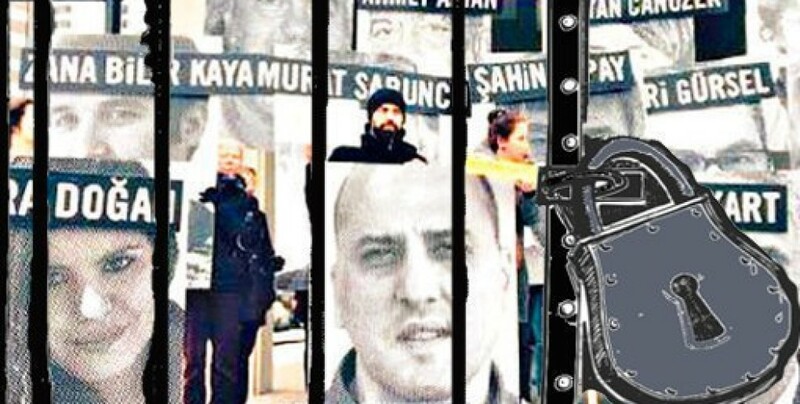 The arrested journalists faced with charges such as “Supporting coup”, “attempting to annihilate Constitutional Order”, “aiding or cooperating with armed organizations such as “FETÖ, PKK, DHKPC, MLKP, DHKP-C, TKEP/L”. In the same period of last year, 18 of the 131 imprisoned journalists were convicted; seven were being tried and 106 were being prosecuted. During October-November-December period, upon the applications of two journalists (Ali Kıdık and Hacı Boğatekin), one publisher (İrfan Sancı) and a media outlet (Bizim FM), the Constitutional Court (AYM) ruled 17 thousand 400 Liras of compensation on the ground that their freedom of expression was unlawfully violated. 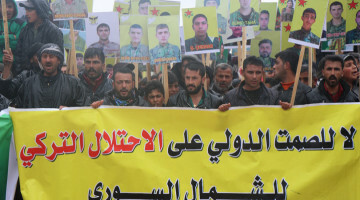 However, the AYM remained silent against applications of at least 22 journalists who werearrested under the OHAL and have been kept in heavy isolation conditions. The European Court of Human Rights (ECtHR) made a single decision in terms of the complaints about freedom of expression during the period of October-November-December 2017. Vesta magazine official Fatih Taş, who was sentenced to deferred imprisonment on charge of “illegal organization propaganda” due to his article entitled “Kürt Aydını Hakkında” (About Kurdish Intellectual), was paid 4,430 Euros. Even though the ECtHR attached “priority” to the files of arrested journalists who left Turkey by an amendment in Bylaw, it left 17 journalists being kept in prison “as a precautionary measure” to the “normal procedure”. Most recently Zaman columnist Ahmet Turan Alkan, who faces lifetime imprisonment, and Yeni Asya newspaper editor Nur Ener, who is arrested for “being a member of an illegal organization”, applied to the ECtHR. 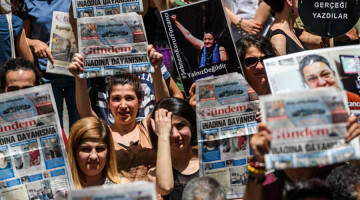 The government demanded that the applications concerning Cumhuriyet daily newspaper staff and Die Welt reporter Deniz Yücel be rejected. 17 journalists or media workers were detained in three months. 10 of the journalists were in detention as part of the “Kurdish Question” and five as part of the “FETÖ” investigations. In the same period of last year, 41 journalists and media staff including 21 of whom were media workers who were working at media outlets that were closed by statutory decrees, and four of whom were international media representatives, were detained. During the whole 2016, the total number of detentions was 201 of which 21 were related to the OHAL period. Six journalists and one media organ were attacked during October, November, December; journalists Fatih Portakal, Fatih Altaylı, Burcu Yıldırım, and Cumhuriyet newspaper staff were threatened with death. In the same period of 2016, eight journalists and one newspaper center were attacked and two journalists were threatened. Besides, 105 journalists and one media organ were threatened virtually or on social media by pro-government circles. Two journalists and one news site were verbally attacked. During the whole 2016, 56 of the media workers who were assigned at conflict zones were attacked. 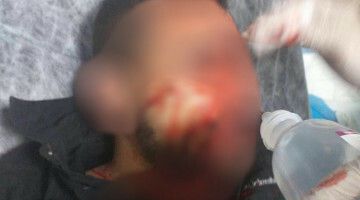 Six media organs were targeted and one Syrian journalist was killed in this period. Again last year, 118 journalists and five media outlets were threatened. During October-November-December 2017, 85 journalists and media representatives faced 237 aggravated lifetime imprisonment on charge of “participating in the coup”. Besides, seven journalists face 70 years in prison in total on charges of “espionage” or “released state’s confidential information”. 61 journalists or media workers faced 430 years and 6 months in prison on charges of “propagandizing for an illegal organization” or “covering statements issued by an illegal organization”. Six of them were sentenced to 10 years 7 months and 2 days in prison in total and two others were acquitted. 293 journalists face 2 thousand 917 years in prison in total on charges of “managing an illegal organization”, “being a member of an illegal organization”, “committing crime as a non-member on behalf of an illegal organization”, “aiding an illegal organization”. Four of them were sentenced to 48 years in prison in total and one other was acquitted. Four journalists face 8 years in prison for “insulting Turkish national and law enforcement”; four of them were sentenced to 2 years and 1 month in prison and fined 3 thousand Liras in total. Besides, a journalist has been recently sued. Six journalists face 18 years in prison on charge of “promoting crime and criminal”. Four of them facing 12 years in prison appeared before judge and were acquitted. Three journalists faced 13 years and 6 months in prison on charge “inciting people to enmity and hostility”, one of them was acquitted. 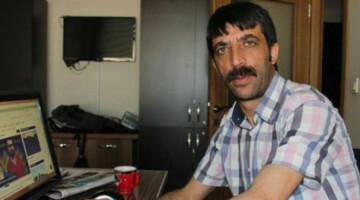 One journalist was sentenced to 1 year and 3 months in prison for “insulting memory of Atatürk”. In total, 464 journalists faced 237 aggravated lifetime imprisonment and 3 thousand 474 years in prison. When the prosecutions regarding “insult” and “insulting the President” are included in the picture, 520 journalists or media representatives face 237 aggravated lifetime imprisonment and 3 thousand 672 years and 6 months in prison. During the period of October-November-December 2017, nine journalists faced 30 years and 4 months in prison as part of the legal suit filed over “insult”. As one of them was sentenced to 1 year 5 months and 15 days in prison, another one was acquitted. New suits: 22 media workers faced 51 years and 4 months in prison in new legal suits brought against them. Five journalists, two newspapers, one website, one cartoonist faced to pay fine of 2 million 790 thousand TL; the court rejected 200 thousand of it. In the same period of 2016, one local journalist was fined 7 thousand 300 liras. In the same period, seven journalists were facing 62 years and 4 months in prison, and fine of 100 thousand TL in the same period. During the whole 2016, 22 journalists and one website official were sentenced to 8 years and 2 days in prison and fined 99 thousand 670 TL. Five journalists were fined 28 thousand liras in total. Four journalists were acquitted and cases of the two others dropped due to Conditional Pardon. Five journalists were sentenced to 1 year 11 months and 10 days in prison and fined 42 thousand TL on charge of “insulting the President” within the scope of Turkish Penal Code (TCK) Article No. 299. One journalist was acquitted. Six journalists were recently sued over “insulting the President”, trials of 14 others are ongoing. Thus, 20 journalists face 98 years in prison in total. Given that two journalists were prosecuted as well, one can say that 28 journalists are victims, suspects and defendant of Erdoğan only in the last three months. During the same period of 2016, there was no journalist convicted by the TCK Article No. 299. However, legal suit of seven journalists filed on the same charge were continuing. Eight of them were acquitted. During the whole 2016, 16 people including 12 journalists were sentenced to 15 years and 4 days in prison, and fined 42 thousand TL over Article 299. 31 people 13 of whom are journalists were acquitted in the legal suits filed over Article 299. During October-November-December 2017, at least 36 news sites, eight caricatures, six books and three newspapers were censored. As a gag order was issued, at least two censorship incidents occurred in the same period. As Criminal Judgeship of Peace doesn’t take any action against Social Fabric Foundation Chair Nurettin Yıldız saying “A 6-year-old child can get married”, Carlos Latuff’s caricatures, books such as “Rojava: Times of Kurds” by Fehim Taştekin, “Civil War of Kurds” by Faysal Dağlı, “Confidential/Turkey’s Secrets in Confidential Documents” by Barış Pehlivan and Barış Terkoğlu were censored. During the same period of 2016, at least 12 publication ban or temporary publication bans were issued, eight news sites were censored. 24 media outlets were closed by the statutory decree; 54 journalists’ assets were seized. During this period in which two journalists from the international media were imposed entry ban to Turkey, one journalist’s continuous press card was not renewed, two others’ press cards were cancelled. 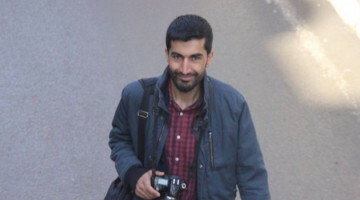 The trials concerning killing of journalist Haydar Meriç, Hürriyet daily newspaper building being attacked twice on September 6 and 8,2015, Doğan Group being raided at the coup attempt night, TRT Harbiye building being occupied at the coup attempt night and A Haber broadcast being banned still continue. The legal suit brought against 59 people for “wiretapping MPs, entrepreneurs and journalists on behalf of the FETÖ” still continues. The legal suit concerning journalist Ali Bayramoğlu being attacked as he was voting in the wake of him declaring that he would vote ‘no’ in the Referendum will start in February. 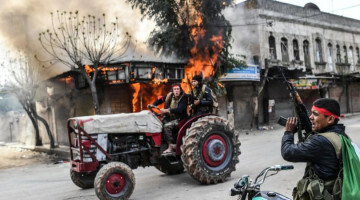 Over 10 journalists being attacked by law enforcers and a group of people as they were covering an attack against Midyat Security Directorate has not been for 19 months. Concerning murder of Syrian dissident activist Oruoba Barakat and his journalist daughter Halla Barakat in Üsküdar, İstanbul, murder suspect Ahmet Barakat was captured in Bursa. During October-November-December 2017, 46 journalists and media workers were discharged or forced to discharge. On the other hand, four former employees of Sputnik Türkiye Group filed reemployment lawsuit. During the same period of 2016, as many as 2,500 journalists were left unemployed resulting from media organs being closed by statutory decree. This figure reached 2,708 in the whole year. However, Journalists’ Association of Turkey (TGC) had declared that the number of people who were left unemployed reached 10 thousand. 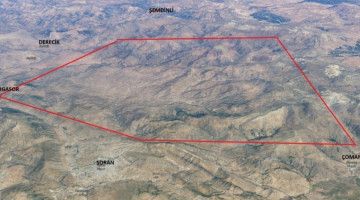 Radio and Television Supreme Council (RTÜK) amerced TV outlets 20 times over their news, movies and program broadcasts. The council gave penalty of halting the program to radio and TV channels and fined them 5 million 657 thousand and 740 TL in total. During the same period of 2016, TV outlets were warned six times, fined 11 times, and that the radio outlets were warned one time and fined five times. Radio and TV channels were fined 1 million 559 thousand 955 TL in total. During the whole 2016, the TV channels were warned for 50 times, fined 112 times by the RTÜK and they also faced two penalties of going off the air. The radio stations received seven warning and 11 fines. The total number of fines reached 15 million 907 thousand and 627 liras.